A supply channel is composed of three structures. At one end of the channel is the manufacturer. The manufacturer focuses on the development and production of products and originates the distribution process. The terminal point in the channel is the retailer who sells goods and services directly to the customer for their personal, non-business use. In between the two lies a process called distribution, which is more difficult to define. One involved in the distribution process is labeled a "distributor." The APICS Dictionary describes a distributor as "a business that does not manufacture its own products but purchases and resells these products. Such a business usually maintains a finished goods inventory." The proliferation of alternative distribution forms, such as warehouse clubs, catalog sales, marketing channel specialists, and mail order, have blurred functional distinctions and increased the difficulty of defining both the distribution process and the term distributor. One ultimately could maintain that distributors include all enterprises that sell products to retailers and other merchants—and/or to industrial, institutional, and commercial users—but do not sell in significant amounts to the ultimate customer. According to this definition, most companies that are involved with the disbursement of raw materials and finished products belong, in one sense or another, to the distribution industry. By adopting this definition, distribution is expanded to cover nearly every form of materials management and physical distribution activity performed by channel constituents, except for the processes of manufacturing and retailing. Distribution channels are formed to solve three critical distribution problems: functional performance, reduced complexity, and specialization. The central focus of distribution is to increase the efficiency of time, place, and delivery utility. When demand and product availability are immediate, the producer can perform the exchange and delivery functions itself. However, as the number of producers grows and the geographical dispersion of the customer base expands, the need for both internal and external intermediaries who can facilitate the flow of products, services, and information via a distribution process increases. Sorting is the function of physically separating a heterogeneous group of items into homogeneous subgroups. This includes grading and grouping individual items into an inventory lot by quality or eliminating defects from the lot. Accumulating is the function of combining homogeneous stocks of products into larger groups of supply. Allocation is the function of breaking down large lots of products into smaller salable units. Assorting is the function of mixing similar or functionally related items into assortments to meet customer demand. For example, putting items into kit form. As the supply chain grows more complex, costs and inefficiencies multiply in the channel. In response, some channels add or contain partners that specialize in one or more of the elements of distribution, such as exchange or warehousing. Specialization then improves the channel by increasing the velocity of goods and value-added services and reducing costs associated with selling, transportation, carrying inventory, warehousing, order processing, and credit. Product acquisition. This means acquiring products in a finished or semi-finished state from either a manufacturer or through another distributor that is higher up in the supply channel. These functions can be performed by independent channel intermediaries or by the distribution facilities of manufacturing companies. Product movement. This implies significant effort spent on product movement up or down the supply channel. Product transaction. Distributors can be characterized as selling products in bulk quantities solely for the purpose of resale or business use. Downstream businesses will then sell these products to other distributors or retailers who will sell them directly to the end customer, or to manufacturers who will consume the material/components in their own production processes. Selling and promoting. This function is very important to manufacturers. One strategy involves the use of distribution channels to carry out the responsibilities of product deployment. In addition to being marketing experts in their industry, distribution firms usually have direct-selling organizations and a detailed knowledge of their customers and their expectations. The manufacturer utilizing this distributor can then tap into these resources. Also, because of the scale of the distributing firm's operations and its specialized skill in channel management, it can significantly improve the time, place, and possession utilities by housing inventory closer to the market. These advantages mean that the manufacturer can reach many small, distant customers at a relatively low cost, thus allowing the manufacturer to focus its expenditures on product development and its core production processes. Buying and building product assortments. This is an extremely important function for retailers. Most retailers prefer to deal with few suppliers providing a wide assortment of products that fit their merchandizing strategy rather than many with limited product lines. This, of course, saves on purchasing, transportation, and merchandizing costs. Distribution firms have the ability to bring together related products from multiple manufacturers and assemble the right combination of these products in quantities that meet the retailer's requirements in a cost-efficient manner. Bulk breaking. This is one of the fundamental functions of distribution. Manufacturers normally produce large quantities of a limited number of products. However, retailers normally require smaller quantities of multiple products. When the distribution function handles this requirement it keeps the manufacturer from having to break bulk and repackage its product to fit individual requirements. Lean manufacturing and JIT techniques are continuously seeking ways to reduce lot sizes, so this function enhances that goal. Value-added processing. Postponement specifies that products should be kept at the highest possible level in the pipeline in large, generic quantities that can be customized into their final form as close as possible to the actual final sale. The distributor can facilitate this process by performing sorting, labeling, blending, kitting, packaging, and light final assembly at one or more points within the supply channel. This significantly reduces end-product obsolescence and minimizes the risk inherent with carrying finished goods inventory. Transportation. The movement of goods from the manufacturer to the retailer is a critical function of distribution. Delivery encompasses those activities that are necessary to ensure that the right product is available to the customer at the right time and right place. This frequently means that a structure of central, branch, and field warehouses, geographically situated in the appropriate locations, are needed to achieve optimum customer service. Transportation's goal is to ensure that goods are positioned properly in the channel in a quick, cost-effective, and consistent manner. Warehousing. Warehousing exists to provide access to sufficient stock in order to satisfy anticipated customer requirements, and to act as a buffer against supply and demand uncertainties. Since demand is often located far from the source (manufacturer), warehousing can provide a wide range of marketplaces that manufacturers, functioning independently, could not penetrate. Marketing information. The distribution channel also can provide information regarding product, marketplace issues, and competitors' activities in a relatively short time. The need for more detailed distribution planning led to the emergence of distribution requirements planning (DRP) during the 1970s. DRP is a widely used and potentially powerful technique for helping outbound logistics systems manage and minimize inbound inventories. This concept extended the time-phase order point found in material requirements planning (MRP) logic to the management of channel inventory. By the 1980s DRP had become a standard approach for planning and controlling distribution logistics activities and had evolved into distribution resource planning. The concept now embraces all business functions in the supply channel, not just inventory and logistics, and is termed DRP II. DRP is usually used with an MRP system, although most DRP models are more comprehensive than stand-alone MRP models and can schedule transportation. The underlying rationale for DRP is to more accurately fore-cast demand and then use that information to develop delivery schedules. This way, distribution firms can minimize inbound inventory by using MRP in conjunction with other schedules. time interval between the arrival of goods on their docks and the entry of the goods into the inventory system. For example, a firm may have a staging area where goods remain for an average time period while awaiting quality or quantity verification. Hence, planned order receipt may be during the planning period when the goods are needed, or they may need to be received earlier depending on time requirements. Order release is then determined by offsetting the planned order receipt by the supplier's lead time. 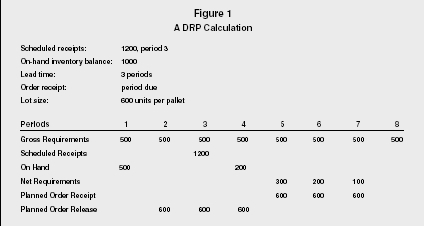 Figure 1 is a representation of a DRP calculation (ignoring possible safety stock requirements). Coyle, John J., Edward J. Bardi, and C. John Langley, Jr. The Management of Business Logistics: A Supply Chain Perspective. 7th ed. Mason, OH: South-Western/Thomson Learning, 2003. Ross, David Frederick. Distribution Planning and Control: Managing in the Era of Supply Chain Management. 2nd ed. Boston: Kluwer Academic Publishers, 2004.